Andrew Silverman is an attorney in the firm’s Business Department. Andrew’s practice focuses on providing advice to both principals and stakeholders of Delaware and Pennsylvania business entities concerning mergers and acquisitions, business divorce and inter-company conflicts, complex corporate governance and financing matters, intellectual property, and commercial agreements. Andrew is a graduate of the University of Pittsburgh and Widener University School of Law. In addition to practicing law, Andrew is on the board of the World Trade Center Delaware, whose mission is to assist Delaware entities and those who seek to do business in Delaware with international commerce. Prior to his work with MacElree Harvey, Andrew was an attorney at a national litigation boutique where he specialized in business, commercial, and tort litigation in Delaware. Represented client in food hygiene industry with respect to multi-million dollar strategic co-investment into industry partner; successfully negotiated board seats and joint venture agreement. Counseled biotech seller in the sale of membership interest, including successful negotiation of earn-out and transfer pricing. Represented technology firm and stockholders’ representative in the sale of stock to publicly traded company in exchange for cash consideration and restricted stock in purchaser entity; in addition, negotiated favorable executive compensation and earn-out protections on behalf of stockholders. Counseled limited partnership with respect to conversion to limited liability company; successfully resolved complex governance matters with limited partners. Counseled real estate joint venture with respect to the formation, organization, and successful series A offering. Representation of international watch retailer concerning the successful disposition of e-commerce and manufacturing agreements. Represented technology company staged for public offering regarding complex governance structure and restricted stock plan. Successful prosecution and resolution of declaratory action under 8 Del. C. § 225 in the Delaware Court of Chancery to avoid a takeover by minority stockholders. Prosecuted stockholder oppression action against controlling stockholder of a Pennsylvania corporation to a negotiated settlement that resulted in client’s ownership of the company’s intellectual property in addition to cash consideration. Successful representation of a client in Delaware Court of Chancery regarding business divorce and breach of limited liability company agreement. Counseled member of 50/50 Delaware limited liability company concerning business divorce and buy-out matter, resulting in favorable buy-out terms and avoidance of litigation. Successful representation of minority stockholder in Pennsylvania corporation with respect to the redemption of minority stockholder’s interest on favorable terms. Mr. Silverman handled the sale of my technology company to my partners. I was empowered during the transactions by a wonderful confidence knowing he and his firm 'had my back'. The sale went through smoothly and included a variety of protections that I would have otherwise missed. I appreciated the follow-through and intelligence of his communications during the whole process. Andrew Silverman provided straightforward, professional legal advice, allowing me to resolve, efficiently and confidently, an otherwise unsettling contractual matter. Andrew is intelligent and trustworthy, and I feel reassured to have him as my attorney. He was quickly able to identify issues for my consideration, providing insight into areas where I could consider protecting me. His matter-of-fact approach led to a satisfactory resolution of the situation without drama, anxiety or delay. 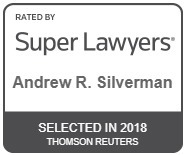 I strongly endorse Andrew Silverman with my highest and unqualified recommendation. Andy provided legal background and oversight on a sticky situation with a disgruntled employee. He helped us to learn about our rights/responsibilities and consider a variety of outcomes which lead us to pursue the most reasonable response. He was professional, available and kind. University of Pittsburgh, B.A. in Political Science.